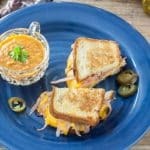 Here’s a fun variation on a traditional Grilled Cheese Sandwich that has a nice sweet and spicy kick! This Jalapeño Grilled Cheese is so delicious!! I made candied jalapeños in October when I was trying to use up the plethora of peppers that I had at the end of the season! (Recipe coming soon!) After that process there was almost a pint of marinade left so I saved it. We have literally been using it on everything! Like these Jalapeño Pork Chops, Jalapeño Roast Chicken, and this aioli that this recipe is based upon. You can buy candied jalapeños everywhere. After the jar is used up, don’t discard juice! It is awesome! You can make a homemade aioli, which is easy and awesome, or you can just use your favorite mayonnaise! Add a few tablespoons of mayonnaise to a small bowl and add a teaspoon or so of the juice from the candied jalapeños! I’ve used it to jazz up tartar sauce for fish too! It is so good! Not too hot! Even Eric likes it and he not a fan of spicy heat! So, you know how instead of using butter for grilled cheese, most restaurants use mayo? (yes they do!) I had the bright idea to use another of our favorite new condiments, namely Jalapeño Aioli, instead of mayonnaise for these grilled cheese. My oldest son came down around dinner time and I asked if he was hungery. He said that he wasn’t really and would wait a bit. Until I told him of my plan! Then he decided that maybe he was hungry! Of course, my son and I added some additional jalapeños to our grilled cheese! We served it with my Curried Carrot Soup, which is equally delicious! So that’s it! Not really a recipe, just a wonderful brainstorm! I did both, grilled tuna and cheese and grilled ham and cheese! They wer both so good! I hope you enjoyed this latest post for Candied Jalapeño Grilled Cheese Sandwiches! It couldn’t be easier and is a great way to jazz up a boring grilled cheese sandwich! These are so easy and delicious! A great lunch, or serve with a bowl of soup and make it a meal! Mix ingredients together for aioli. Spread one side of each slice of bread with a little aioli. Place in frying pan or griddle aioli side down. Then build sandwich with cheese, meat if you choose, and as many candied jalapénos as you like. Top with the second slice of bread basted with the aioli, (aioli side up). Once the first side is golden brown, flip and brown the second side. Serve hot. « Garlic Scallops for Valentines Day! I am totally intrigued with the idea of Candied Jalapeños. That sounds like something my house *needs* asap! I’ll bet the juice really makes this grilled cheese something special, too! I am officially obsessed with candied jalapeños lately! I could eat them on everything! Thanks, Renee! Jalapeños and I have a huge love affair! They are good on just about everything! Thanks, Sarah! My kind of grilled cheese! Everything is better with jalapeños! Especially when they’re candied! Um! I so need to come to your house so I can have some candied jalapenos!! Better yet, I love the thought of having the jalapenos on my grilled cheese! I didn’t know they put mayo on the outside of the bread instead of butter. Hmm. I wonder why! Anyway, I look forward to trying your recipe! Great job! You should come to my house anyway! Yes, they do. mayonnaise is cheaper and completes the purpose. Thanks so much, Elaine! They are so good! I should make one right now!! Thanks, Adriana! home made aioli is always the BEST! and candied jalapenos sound amazing — I need those in my life! They are so good! Thank you so much, Vicky! This is different! Love the kick of jalapenos, I want to give this a try! So delicious!! Love them sooo much!! Thanks Colleen! It’s my homemade brioche bread! It’s sooo good! Thanks Hannah! Haha! I think most kids did! These jalapeños kick it up at notch! Thanks Marie!